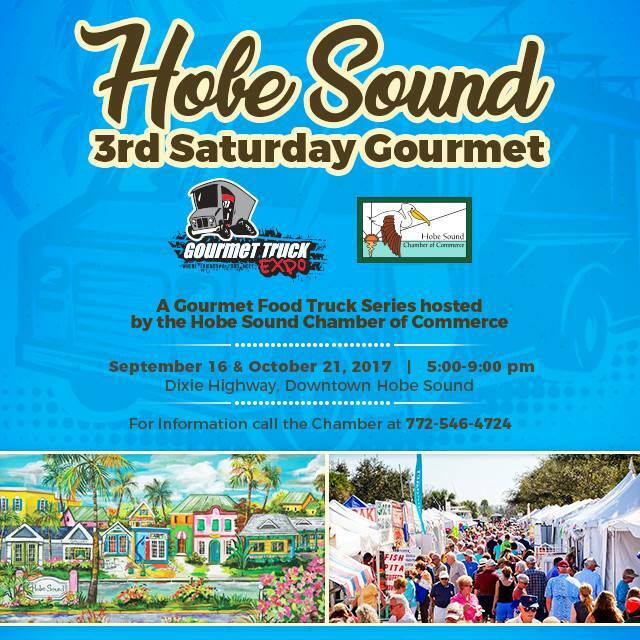 Hobe Sound Chamber of Commerce and Gourmet Truck Expo are pleased to announce a brand new community event coming to Hobe Sound in February through May 2017 –3rd Saturday Gourmet will include food trucks & craft vendors from 5:00 pm-9:00 pm in downtown Hobe Sound. Patrons can park along Dixie Highway and peruse the local shops as they walk to the vendors located on Mars and Apollo Streets. The event will feature many local establishments participating with extended hours, sales, specials, door prizes and more! Visit boutiques, Hobe Sound Art Gallery, jewelry stores and other businesses. Make an entire evening of it and visit Taste Casual Dining for cocktails and entertainment. Have a Pet? Don’t forget! They are welcome too! Hobe Sound Veterinarian Clinic will have surprises for your furry friend. You’ll be sure to see and taste something new in Hobe Sound for 3rd Saturday Gourmet. For GPS Directions – Please use Juno Shoe Girls’ address in your GPS, 11766 SE Dixie Highway, Hobe Sound. For more information please call the Hobe Sound Chamber of Commerce at 772-546-4724.